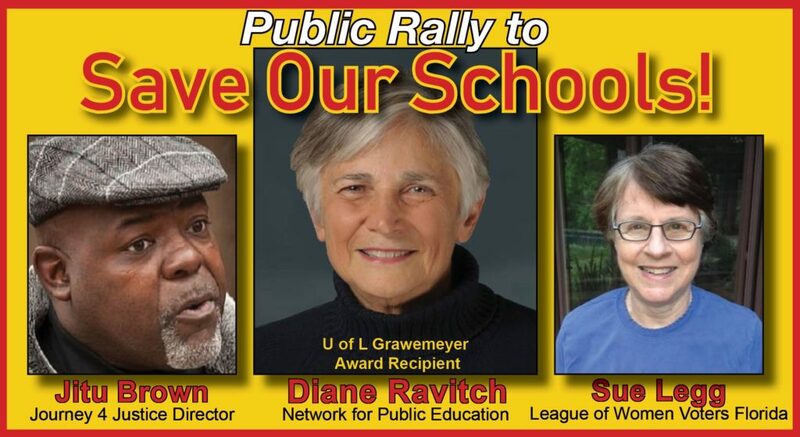 Home › Admin › Rally to Save Our Schools, Featuring Diane Ravitch and Jitu Brown! Come hear from Diane Ravitch, Jitu Brown and Sue Legg about the threats facing urban and rural public schools across the country and in our OWN BACK YARDS! Food trucks, entertainment, vendors, sponsor tables, candidates, spoken word artists, open mic and more. (Hannah Drake, emcee). Gather at Central High Schools Courtyard and Practice Field and connect with family and friends, grab a bite to eat, and learn about the ways various organizations, candidates and vendors support public education before heading into the auditorium to hear these amazing speakers. *A limited number of guaranteed seats are available here. Prices range from $35 for VIP tickets (with a Backstage pass) to $5 for Premium Balcony Seating. * An additional 700 FREE “general admission” tickets to the auditorium event will be made available from co-sponsoring organizations or at WILL CALL on the day of the event. Diane Ravitch is the former assistant secretary of education under Lamar Alexander (1991-1993) and was a staunch proponent of today’s most popular ideas for restructuring schools, including privatization, standardized testing, punitive accountability, and the feckless multiplication of charter schools. In a stunning about-face in 2010, she published The Death and Life of the Great American School System – How Testing and Choice Are Undermining Education, followed by Reign of Error – The Hoax of the Privatization Movement and the Danger to America’s Public Schools in 2013. That same year, she co-founded Network for Public Education, which fights to save our public schools. Jitu Brown is a Chicago native, former public school teacher, and community organizer who serves as national director of the Journey for Justice, an alliance of grassroots groups fighting against privatization and for sustainable community schools in 30 cities. Brown has been an education activist for the past 26 years. In 2015, he led a successful 34-day hunger strike to prevent the closing of Dyett High School in Chicago’s south side. Sue Legg holds a Ph.D. in Educational Research, Measurement and Evaluation. Early in her career, she taught in public schools, and later she directed the Office of Instructional Resources (OIR) at the University of Florida. Her experience at OIR included the management of several statewide K-12 and college assessment programs for the Florida Department of Education. She was Coordinator of Distance Education at U.F., directed C.I.R.C.A. computing labs, and oversaw a number of other units. Visit SaveOurSchoolsKY.org or call 502-565-8397 for more info.